Southwark Council announced last week that 56 new council homes have been provided by a new private development at Blackfriars Circus and that they are a step towards achieving the Council’s ambition to build 11000 new council homes over the next 30 years. 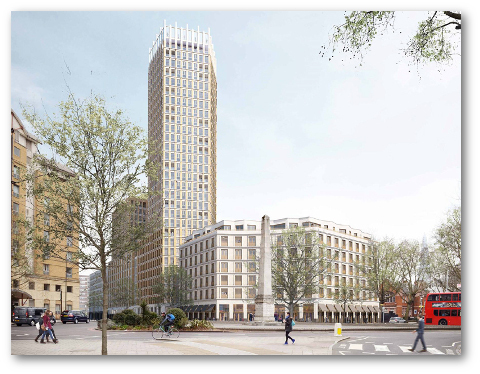 The reality of this claim is somewhat different and worth examining; Blackfriars Circus overlooks the South Bank University campus at the Elephant & Castle and comprises 336 new homes in 5 buildings, ranging up to 27 storeys in height. New apartments in the latest phase, the Delphini apartments, have been available since the beginning of the year, starting at £665k for a studio flat. The scheme should have provided 70 social rented and 47 shared ownership homes, in accordance with Southwark’s 35% affordable housing policy. However, in time-honoured fashion the developer, Barratt Homes, submitted a viability assessment, claiming that only 30% affordable housing was viable, consisting of 35 shared-ownership homes, 8 social rented and 48 affordable rent, at 65% market rent 1. The planning report also said that an additional in lieu payment of £4.7m to make up the 5% shortfall had been proposed. The officer’s report for the planning application explains that the viability assessment had been appraised by the ‘Borough Valuer’ (meaning the District Valuer) and that “Whilst a number of inputs into the valuation have been agreed…. an agreement has not been reached on two fundamental matters: methodology of calculating the benchmark value of the site; and residential sale values. As such, the applicant and the Borough Valuer have not reached an agreed position about how much affordable housing can be delivered on site.” (para. 109). In fact the District Valuer’s view was clear and is related in the s106 agreement, which states “the District Valuer concluded… the development could support the minimum housing requirement.”2. The application was nonetheless given consent and in September 2015 it was further reported that the council was to buy the 8 social and 48 affordable rented homes from Barratt for £10m, in order to turn them into council homes 3. The units were duly purchased and listed amongst the schemes that will deliver Southwark’s 11000 new council homes (128 – 150 Blackfriars Road). Instead of paying £10m for 56 council homes Southwark could have stood firm and insisted that the social rented housing was delivered on site, thereby securing 70 social rented units at no cost to itself and saving £10m to spend on new council homes elsewhere. 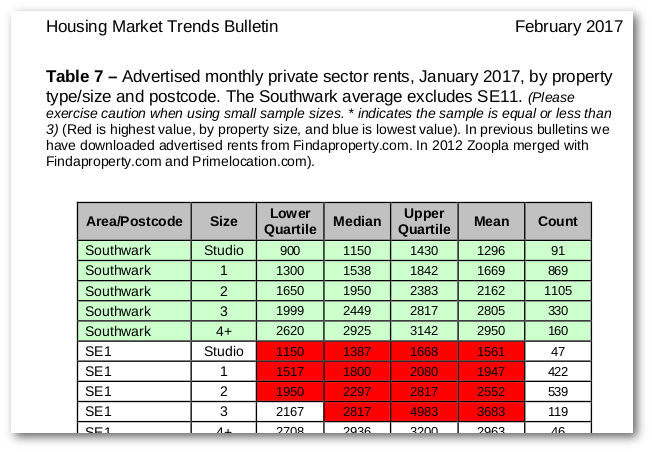 Further, this is not council housing, if as Southwark says in its press release the rent is 40% market rent. A calculation based on the Council’s latest market data gives an average 40% market rent of £235 across all flat sizes compared to an average Council rent of under £100 per week. What we are seeing at Blackfriars Circus is a desperate attempt by Southwark to deliver on its failing manifesto promise to deliver 11,000 new council homes. By buying up section 106 properties Southwark Council is not adding to the amount of social housing stock in the borough. It is simply buying homes that already exist and that housing associations would have otherwise bought and let as social housing.